Big news in the food world today, at least news to me, as Burger King is launching its' limited time summer BBQ menu. The menu features lots of things that I'm sure will not be as good as you want them to be, Memphis Pulled Pork BBQ at a fast food outlet ? ........ I think not. However the boys smokin' the herb in the test kitchen have come up with a menu item that deserves our serious respect, and that would be the Bacon Sundae. 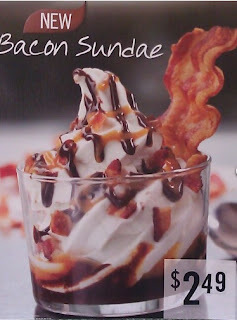 That's right, soft serve ice cream drizzled with chocolate fudge, caramel, and bacon bits and then topped with a "thick sliced, hardwood smoked bacon garnish". This bad boy clocks in at a mere 510 calories, with 18 grams of fat and 61 grams of sugar so you can easily handle one a day for breakfast. I kid you not, starting today in the US of A you can walk into a Burger King and plunk down $2.49, plus applicable taxes, and get an ice cream dessert with bacon .................Yeah Baby. I know it's not going to be as good as I want it to be but still you simply must applaud the effort of a major fast food outlet to increase our bacon consumption, forget the failure of the McLean Burger of the 90s, this is the future and we should rush to embrace it. We need this north of the 49th, if I only knew where there was a Burger King in Vancouver.